ADAM AND EVE DRIVEN FROM THE GARDEN. N THE BEGINNING God made the heaven and the earth He also made the sun, moon, and stars; trees, flowers, and all vegetable life; and all animals, birds, fishes, and insects. Then God made man. The name of the first man was Adam, and the first woman was Eve. Both were placed in a beautiful garden called the Garden of Eden, where they might have been happy continually had they not sinned. But God forbade them to eat of the fruit of the tree of the knowledge of good and evil. Satan tempted Eve to take the fruit of this tree. She ate, and gave to Adam, and he ate also. Thus they sinned, and sin came into the world. Then God called to Adam and said, "Where art thou?" Before this, Adam and Eve had been happy when God was near, now they were afraid. Why? Because they knew they had done wrong. So sin makes us afraid of God. 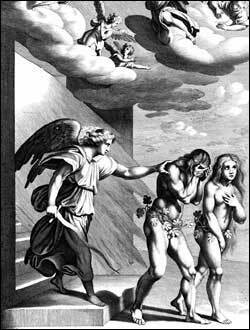 God rebuked them for the evil they had done; and then drove them out of the Garden of Eden, placing an angel to keep watch over the gate so that they could not return.